Jewish Facts From Portland: Who's Fighting Against Hizbullah in Lebanon? Who's Fighting Against Hizbullah in Lebanon? Hizbullah is an Iranian army proxy and tool used by the Iranian mullahs to carry out their expansionism in the act of building their sectarian empire in Lebanon. The Lebanese state is helpless in fighting against them with officials that are merely puppets. Politicians and clergy are corrupt and the judiciary has broken down. Iran gives them about $200 million every year for their terrorism. It is also the political and military force of Lebanon today. 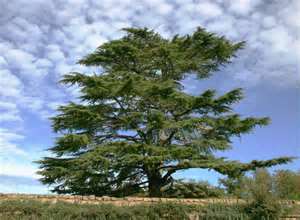 Lebanon, the other country north of Israel referred to in the Torah as famed for their cedars that King Solomon used for the Temple. It held an ancient Jewish population at one time in Beirut, Tripoli, Tyre and Sidon. Jewish men were involved in commerce. All 35 Jewish families in Beirut were slaughtered by the Crusaders. The Spanish Inquisition of 1492 brought in Spanish Jews. This was when Jews had to convert to Catholicism or leave. Many could not leave and didn't want to convert so became hidden Jews. There could be from a handful to about 40 old Jews left in Lebanon today in Beirut from a population of 17,000 in the 60's. . .
Like in other countries in the Ottoman Empire, Jews were treated as dhimmis in about 634 to 1917 when Muhammed died and Islam was spreading. Jews had to pay for protection in the form of a poll tax. There were again 55 Jewish families in 1826 until the blood libel charges were made in 1824 in Beirut and in 1834 in Tripoli. Jews followed the Kosher laws which meant that they did not eat any blood nor would they touch it, but were constantly being accused of doing so by the people around them in the form of somebody's missing son. . In the 20th century the French occupied the land. With them around, life was better in that they only were attacked a few times in the 30's. On November 22, 1943 Lebanon became independent from the French Mandate, and then 12 Jews were murdered in Tripoli. On December 31, 1946, the French left. After the 1947 partition of Palestine, houses and synagogues were attacked by Muslims. In 1948 a Beirut Jew was murdered. In 1950 a Jewish school was bombed and the director killed by Muslim groups. Jews were extorted money as "contributions" which was used to finance Arab Palestinian sabotage. When the state was created, the government was by the Maronite Christians, who were a minority group. When Israel was created, 100,000 Palestinians, so they say, ran to Lebanon and were refugees, upsetting the balance, making Muslims the majority. Lebanon had been ruled by a Christian who was assassinated. A Christina militia remained under Major Saad Hadad who was a friend of Israel. He patrolled the border between Israel and Lebanon from Palestinian terrorists. In 1982 Israel went into Lebanon after being hit too often by the terrorists. Israel had to do this before in 1978 and cleared out the PLO strongholds. This time Hadad asked Sharon if he and his men could go in to do the job and there was a massacre at Sabra and Shatila. From 763 to 3,500 civilians were killed by the militia's hands, but Sharon took the blame. "Hezbollah first came to notice outside of Lebanon in 1983, when it was blamed for the bombing of a U.S. Marine barracks in Beirut, killing 240 soldiers. Now it has an armed militia more powerful than the Lebanese Army and a sprawling infrastructure that delivers welfare to its Shiite constituency, Lebanon’s largest community." They're even into the cocaine trade and money laundering. There now exists a class distinction between Hezbollah and the rest of the Lebanese community. The bad guys have taken over and have destroyed any human rights that may have existed by invading homes, selling weapons, stealing and killing, braking all laws, assassinating and intimidating and humiliating any opposers. They even kidnap their own citizens and act like the Mafiosos. Beirut used to be the Paris of the Middle East but has turned into a nightmare. Hizbullah assassinated Pierre Gemayal, the 5th anti-Syrian/anti Hizbullah killed in Lebanon within a 2 year period in 2006. He was 34 years old. "Gemayel, Lebanon’s industry minister and a member of the Phalange Party, had just left a church and was traveling through Jdeideh when a vehicle in front of him slammed to a stop, causing his car to ram it, security officials said. Witnesses said Gemayel’s car was also struck from behind. 3 gunmen then stepped out and shot him dead. Another of his family, Bachir Gemayel, who was president, was also assassinated on Sept 14, 1982 with 26 others when a bomb went off in their Phalange headquarters. He was also only 34 years old. Hizbullah was attacking Israel also, and was known to have been supported by Syria, Iran, Russia and China. Lebanon is the 35th Muslim majority country with 4,196,453 people of which 60% are either Sunni or Shi'a. They are smaller than Israel with only 4,500 square miles. Now they are flooded with an unknown number of Hezbollah terrorists and evidently can't fight them off. .
From Time Immemorial by Joan Peters page 65-66.